How to make a professional Project Review Meeting Agenda? 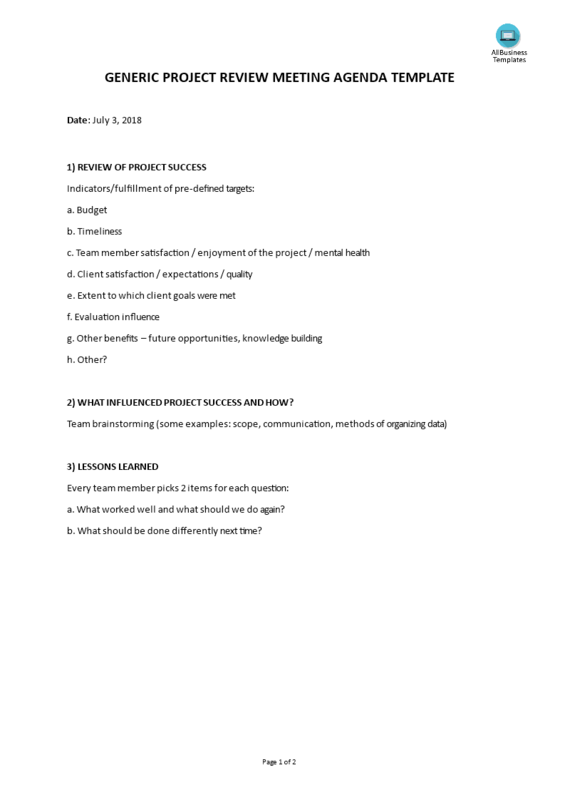 Download this Project Review Meeting Agenda template now! Adequate communication is essential in order to finish projects successfully. In order to gain truthful and accurate information, you need to make sure that program- or project managers are able to make rational and correct decisions. For those who have, what we call, a "high-performance mindset”, we know they prefer to work with the latest update of professional project management templates, in order to achieve their goals faster. We are certain this Project Review Meeting Agenda will be of value. 2) WHAT INFLUENCED PROJECT SUCCESS AND HOW? a. What worked well and what should we do again? b. What should be done differently next time? Feel free to download this Project Review Meeting Agenda, or simply browse through our other basic or advanced template designs. They are intuitive and in several kinds of formats, such as PDF, DOC, DOCX, etc. Using this project management review template guarantees that you will save time, cost and efforts and makes you more successful in your project! Holding an effective and efficient Project Review Meeting has never been easier! Download this project review template now!